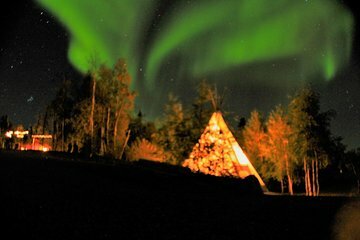 Lasciati stupire dalla maestosità di Madre Natura in questo tour di osservazione della Northern Lights di 3 giorni da Yellowknife. Lasciate le luci brillanti di Yellowknife alle spalle e viaggiate nei possenti territori del nord-ovest del Canada con la vostra guida. Visita una gamma di luoghi di osservazione diversi sotto la copertura dell'oscurità e guarda i cieli per la spettacolare aurora boreale, o Aurora boreale. Goditi una deliziosa cena di 3 portate all'Aurora Village, poi rilassati in tee riscaldate mentre i cieli brillano sopra la tua testa. Le tue giornate sono libere di godere di attività extra facoltative, tra cui pesca, escursioni nella natura, slitte trainate da cani, escursioni in motoslitta o escursioni. We spent 4 days 3 nights chasing Northern lights: 2 nights hunting and 1 night viewing at the Aurora village. We called the local operator to find out the difference between hunting and viewing, and the choice of 2 night's hunting was perfect: we saw the lights on both nights. The Aurora village viewing was a rip off. We sat in the heated teepee from 10 pm to 12:30am, doing nothing, seeing nothing. Some people chose 3 nights viewing, saw nothing at all. Artic Tour guides were friendly and knowledgeable. Very helpful. We enjoyed the whole trip. The operator is ArcticTours, our driver and guide Windfred was very nice. We went for Aurora hunting for two nights. The third night was with the Aurora Village tour. We saw just a little bit of the light and the light was very weak. The camera sees it better than our naked eyes. I have submitted a review in response to your request for the above tour on September 19, 2015 but have not seen it published. I would appreciate knowing why my review is rejected.